Jack has horrible handwriting; it is worse than doctor handwriting. We have been trying to work with him on it for the last year or so. He will get better for a while then get lazy and go back to his old patterns of fast and messy. I realized after watching him a few months ago that he is actually forming his letters incorrectly. I think it all started back in Kindergarten when he had a huge handwriting packet to do and not enough time to complete it. We just had to get through it or he would have been spending hours each day working on those sheets. It took me some time to realize it all came back to letter formation. 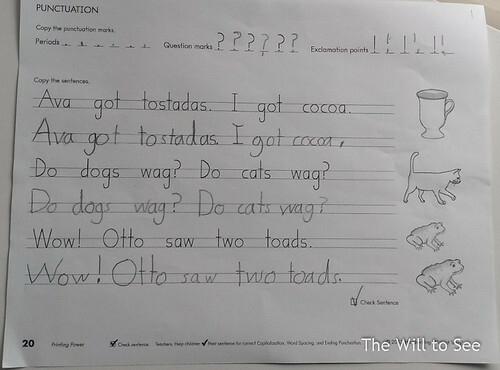 A friend’s son has a similar problem and she got some materials from Handwriting Without Tears. I ordered the booklet and Jack worked on it over spring break. He didn’t make it through the whole book, but at least got through the letter formation pages. They have a different, simpler method of creating the letters than he learned before, or didn’t really learn before. Unfortunately we did have a few tears on the first few days because he didn’t follow directions, but once he learned that he needed to, he did great. 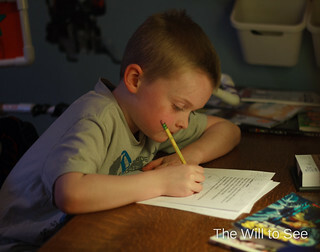 For Will I have been trying to work with him on how to write his letters correctly as he is learning them. I hope this will give him a better foundation and make his writing skills stronger in the beginning. Even though our children will spend most of their lives typing, it is still important for them to learn to write correctly. The handwriting you create now stays with you for the rest of your life. This post was not solicited or compensated in anyway. We have similar concerns for both boys, and will definitely try out the resource you recommend – thanks! My little one would hardly pick up a pencil until Kindegarten! Well when kindegarten started, in the presence of other kids, he did start using pencils and crayons, and I did buy those pencil grippers to help teach little hands to hold the pencil correctly. He took the Handwriting without Tears course the summer prior to Kindegarten-but wasn’t enthralled at the time. He’s doing pretty well now in first grade. Every child is so different and it comes when it comes. Good Luck Sarah! I agree that handwriting is so important. I’ve talked with parents whose kids who grew up in the computer age never did much handwriting and still don’t in their late teens.